South Indian Kadhi or "Mor Kuzhambu" as we call it in Tamil Nadu, literally translates into 'buttermilk stew'. It is an interesting preparation made with lightly cooked beaten curds or buttermilk, and tempered with spices and vegetables or urad dal vadis. Here are two methods we generally follow, the ingredients bit different for both, and the resultant tastes, just as interesting!! 1. Soak coconut, the dals and jeera in a little water to make grinding them a bit easier. 2. Blend them well, along with the green chili in a mixer. 3. Meanwhile add the curds to a thick-bottomed saucepan, add a pinch of haldi, curry leaves and salt to taste and mix well. 4. Add the ground mix to the curds and mix again. Cook on a low flame for about 5 mins, take care not to let the mixture curdle. Remove from fire. 5. Prepare a tempering by heating 1 tsp oil, preferably sesame, add mustard seeds and let crackle. Add the methi seeds and fry for just a few seconds. Do not let the methi seeds become too brown else they'll lend a dour taste to the kadhi. Pour over the kadhi mixture, and serve. If available, you can add the urad dal vadis to the tempering before adding methi seeds, let them roast well and then add to the kadhi. If using vegetables, such as Knol Khol, carrots, pre-cook the vegetables and add to the curd mix and cook along with the ground coconut mixture. 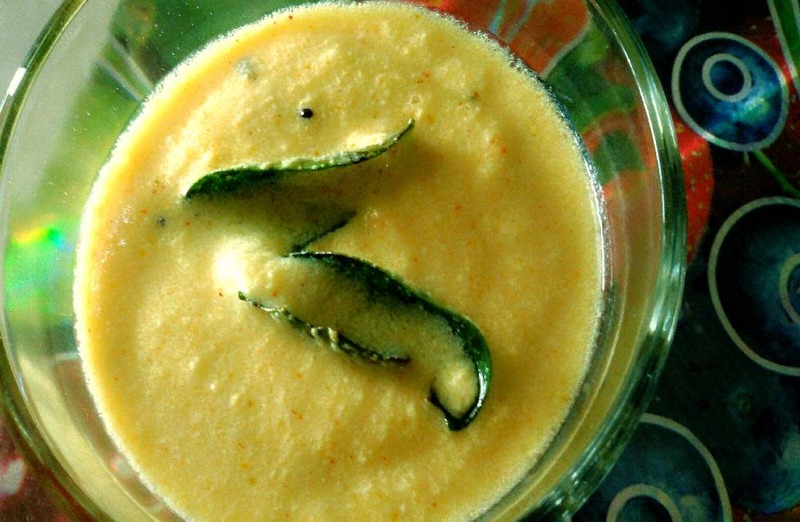 Ladies finger or Okra tastes excellent with this kadhi as well, you will need to fry this in a little oil and a pinch of salt and add it to the kadhi along with the ground mixture. Note : If using buttermilk and you find the consistency a bit thin, make a paste of 1 tbsp rice flour and water and add to the kadhi, this will thicken it up. 1. Heat 1 tsp oil in a pan. Add the red chili and urad dal and roast till the dals become golden brown. Add the methi seeds and fry for just a few seconds. Do not let the methi seeds become too brown. Let cool, then grind them along with the grated/chopped coconut to a smooth paste. 2. Mix together curds, salt, haldi and curry leaves (plus vegetables as mentioned above - optional) in a saucepan. Cook on a low flame. 3. Add the ground masalas and mix well. Continue stirring on a slow flame for about 5-7 minutes. Remove from fire. Prepare tempering by heating 1 tsp oil, add mustard seeds and let crackle. Pour over the kadhi and serve warm.